Updated 11-15-2018 --- Mod has been updated for compatibility with the 1.47.49 (November 13, 2018) game patch. Getting these back to working in the game was rather difficult, it seems in the past EAxis changed the temporary outfit overrides to no longer allow tattoos to be placed on children. I made quite a few different test versions before I found that simply cloning the tattoos and turning them into cummerbunds worked like a charm. I mean, what twisted parents put cummerbunds on children, so why not use that slot since it works? Older Sims can no longer use the temporary tattoos, primarily since changing it to use the cummerbund outfit category introduces the possibility of having a regular tattoo superimposed on a temporary tattoo which would look stupid, but also as you can edit the tattoos for older Sims in the plan outfits. If you have a cummerbund on a child's outfit, or a custom content outfit which uses that slot, it will be temporarily overridden for the duration of a temporary tattoo. This will not modify the outfit itself and the cummerbund part will reappear once the temporary tattoo is removed. 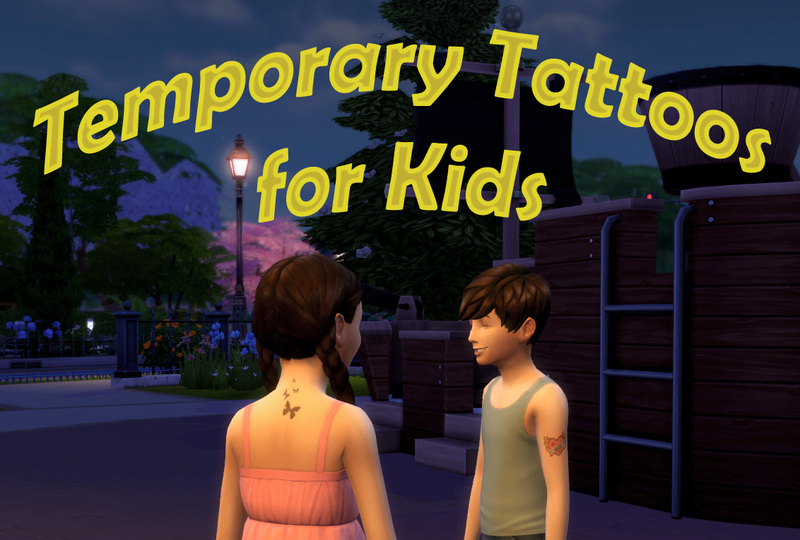 This mod adds temporary tattoos to The Sims 4 that children (and older sims) can put on. These tattoos will last for 12 sim hours. Bathing or showering will remove the tattoo earlier. To use the mod, first one or more temporary tattoos must be purchased from a computer. Temporary tattoos are available from the Order menu on the computers and cost 10 simoleons each. Once tattoo packs are purchased, a sim can click the pack in their inventory and choose Apply Temporary Tattoo (only one tattoo may be applied at a time). The tattoo package will contain a random tattoo from a selection of 12 that I chose as being suitable for temporary tattoos, due to size and child appropriateness. To install the mod manually, extract both the package and ts4script files from the download into your mods folder. The following two files should then be in your mods folder. This mod was written and tested on The Sims 4 version 1.47.49 (November 13, 2018). It is likely to be compatible with several future game versions. This mod overrides two of the game's XML instances to enable tattoos to be removed by showering and bathing. These overrides may conflict with other mods that modify the same tunings. These are "side-effects" of bathing and showering, so I don't know of any existing mods that alter these and it should be fully compatible with most, if not all, bath and shower mods.